I am continuing to work away on the second pattern from Miss Lambert’s My Knitting Book (1843), “A Knitted Silk Cuff.” I was a little slow to get started as I injured one of my fingers in a car door incident and one of my yarn cakes came apart and created a mess of yarn tangle. I am healed now and I have successfully detangled my yarn and organized my project into a special bag made for me by my wonderful sister for two at a time knitting. I am getting used to knitting on 1.5mm needles although I think that for me, this is the lower limit on knitting needle size! Somewhere this week (I can’t remember where, urgh) I read that the smallest knitting needle size on knitting gauges during the Victorian era was 0.4mm. I can’t even begin to imagine knitting with needles that small! As I had hoped, Malabrigo’s Silkpaca is knitting up nicely and is incredibly soft. I am glad that I chose taupe over black for this project, I would have had a terrible time knitting with such small stitches in black as recommended by Miss Lambert. 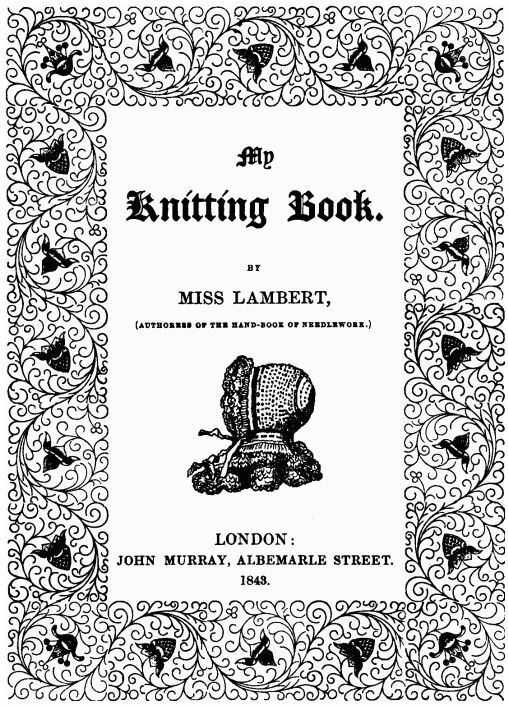 Interestingly, Miss Lambert describes knitting as being an “evening entertainment” suitable for invalids and the elderly. In the Ladies Work Table Book (anonymous author, c.1840, p.12), knitting is described as being easy and requiring little eyesight. I am still finding that I have to really watch what I’m doing on this project and I feel like knitting with fine black silk on tiny needles in low light conditions would be extremely difficult! Here in Ontario, we are experiencing some beautiful spring weather and warm days. The grass is turning green and the leaves are starting to come out on the trees. Our neighbour’s magnolia tree has started to flower and I think it will be in its full glory within a few days if this weather keeps up! Last night, I sat outside and worked on my Knitted Silk Cuffs under a glorious blue sky, with the birds chirping away and the cat playing with bugs in the grass. Quite blissful! Next > Knitting for profit or leisure?